There are over 80 miles of navigable waters for anglers to explore this spring season on Alabama’s mid-state, man-made impoundment Jones Bluff Lake. Officially known as Robert F. Henry Lake. Jones Bluff Lake is situated near the state capitol city of Montgomery, Alabama. Jones Bluff lake has over 373 miles of some very, fishy-looking shoreline. There is fish holding cover in the form of aquatic weeds, wood cover and rock cover to be found lake wide. Jones Bluff lake is fed by two upstream river systems. The Coosa River System feeds the lake via Jordan Lake dam tailrace waters, and the Tallapoosa River System empties into this lake coming off of Lake Martin dam. Thus creating the headwaters of the Alabama River System. This lake consists of over 16,300 square miles of backwaters and some huge, major feeder creeks. During the spring season, this is where most bass are bedding and where most bass anglers concentrate their efforts for bass fishing this lake. But during the pre-spawn season (that begins in March), is when anglers should concentrate their fishing efforts along deeper drops. The first place bass move up shallow, before they head “real shallow” for the next few weeks of April and May. As March gets underway anglers should begin their search for these pre-spawn bass in the same places they fished during the late winter season. 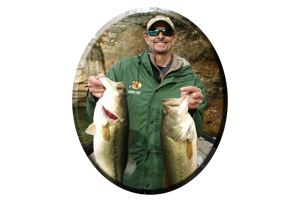 Look for Jones Bluff’s largemouth bass and spotted bass to still be relating to places they held in this past winter season. Where an easy-to-catch meal can be found on a daily basis. 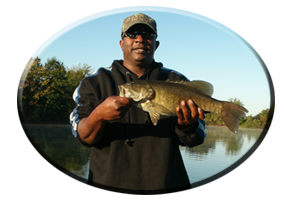 Main Lake Points – These are places on this lake that always hold bass. 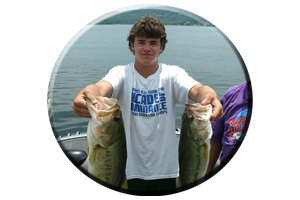 Spotted bass relate to the main lake current that is swept across these main lake points. Bringing them an easy-to-catch meal, such as various types of bait fish and crayfish. As these spotted bass hold along the ends and sides of Jones Bluff’s many washed-out red clay points, hard-bottomed main lake points, or points with scattered rocks or boulders, these Alabama River spotted bass are very susceptible to a number of reaction-strike lures. This can be fishing with shallow to deep diving crankbaits or lipless lures in shad colors or crayfish colors. Or try dragging a jig combo, plastic crayfish, tube bait or creature bait around these main lake points, all of which may simulate an easy-to-catch crayfish meal to these gluttonous, pre-spawn spotted bass. Largemouth bass hold on these points as well. Any form of wood cover, rock cover, irregular bottom feature, or weed bed may hold a big, female pre-spawn largemouth bass in March. Shallow water anglers may even consider targeting early season aquatic weeds growing in the shallows of these points, places that could hold a big, old lazy largemouth bass. So lures may vary if you are searching for this bass quarry. Shallow largemouth bass will hit spinnerbaits, either steady retrieved or slow-rolled or dropped along these main lake points, around any cover or irregular bottom feature. Or you could fool both bass species while fishing main lake points in March! Major Feeder Creeks also have first and secondary points these pre-spawn bass will hold on and feed around in March. Jones Bluff’s many feeder creeks and smaller streams also feature other pre-spawn spots these bass will be moving up shallow to feed and to fatten up, prior to them moving even shallower for bedding in April. Places like flats in these feeder creeks, especially those that feature loads of fish-holding cover found right along the main drop on these creek flats. Look for laying trees, logs, stump rows, brush piles or an early season isolated weed bed near these drops and fish them thoroughly and slowly. Creek channel bends, those that border small cuts and pockets in these creeks or backwaters are places that receive a lot of water warming sunshine in a days time. These pre-spawn spots can be loaded with active bait fish and bass from mid day until late evenings. As warming trends continue on Jones Bluff this spring season these bass will move even shallower, into that 1-3 feet of water, to begin their annual bedding rituals in April. As March slowly comes to an end major changes begin to take place on this lake. Not only changes in the surrounding Jones Bluff lake waters, but changes in attitudes of the lake’s spawning bass as well. At times Jones Bluff lake is low, 1-2 feet down in late winter. By April, its back to full pool bringing bass shallow to feed and to prepare theirs beds in the newly flooded shallows. Spring rains can suddenly bring the lake up to full pool or even flood the shallows with 1-2 feet of water after heavy spring rains. This creates slightly stained to muddy water conditions, that creates a bit of security in these otherwise very spooky bass. April also shows the beginning of new growing aquatic weeds on Jones Bluff lake. Anglers fishing for bass around these weeds should especially target places that get a lot of water warming sunshine in a days time. Look for the warmest waters and the greener weeds in the early part of April, for the more active bass. Bait fish activity only assures anglers that the bass are nearby in these creek backwaters. Lures of all kinds will now attract strikes from these shallow water bass. Bedding bass will always hit a worm, lizard, tube bait, crayfish imitation or jig combo, creature bait or small finesse plastics fished right in the bed. Around weeds and wood cover a spinnerbait is at its best in early April into May. Also try floating worms and soft jerkbaits around any likely looking cover in the shallows in April. Topwater lures come into play in March during warming trends. But in April and May you always count on some exciting blow-ups consistently. So always have a few topwaters rigged and ready…often for some all day action! May- Topwater Time for Post-spawn Bass! This is my favorite month for bass fishing on any Alabama lake, especially Jones Bluff lake! The weeds are in full bloom by the first week of May. Bass and the meals they feed on seem to be everywhere you fish and lots of action fishing with topwater lures! As these bass come off the beds they are hungry. Newly hatched easy-to-catch meals are now appearing on the menu and they take full advantage of it. Anglers should now try lures like frog and rat imitations in and around wood and weed cover. Snakes and worms emerge and anglers should try both floating worms and lizards and Texas rigged plastics as well. * Buzzbaits and big topwaters like Zara Super Spooks and Sammies get the big bass bite! Heavy line of 17-20 pound test is suggested for these and other topwater lures. Poppers, chuggers and prop-baits also come in the shallow water picture in April and May. These noisy topwaters draw curious, recuperating bass in for the kill and a seemingly easy meal is hard for these big bass to resist. An added bonus for anglers fishing Jones Bluff lake this spring season is the amount of creeks that have Cyprus trees in the creek back waters. Topwaters, spinnerbaits and lures like worms, jigs and lizards are deadly when fished around this wood cover. 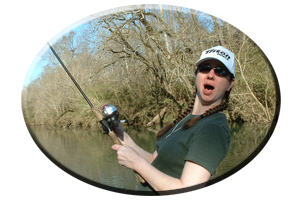 * A link for, “Everything you ever needed to know about fishing the Zara Spook by Reed Montgomery! This link for ordering this 10 page info can be found by clicking here! Go to: www.airportmarine.com for spring sales on closeout boat models of all kinds, new 2009 models, and some really nice used boats as well! 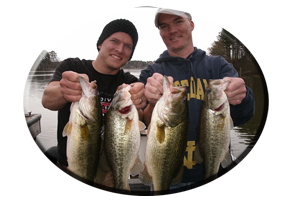 * Interested in fishing Alabama’s most popular and best paying bass tournament trails and annual events? Go to: www.airportmarineteamtrail.com and see their info. Have a safe and courteous spring fishing season! Always wear your life jacket and outboard motor kill switch when boating. Our Alabama lakes are crowded in the spring. Always be courteous to other anglers!